Transparency Market Research observes that the three leading companies in the Asia Pacific piperonyl butoxide (PBO) market are Wujiang Shuguang Chemical Co., Ltd., Sumitomo Chemical Co. Ltd., and ENDURA P.IVA. As of 2015, these companies held a share of 38.0% in the overall market, rendering the competitive landscape moderately consolidated. Analysts point out that the competitive landscape will remain so during the forecast period of 2016 and 2024. 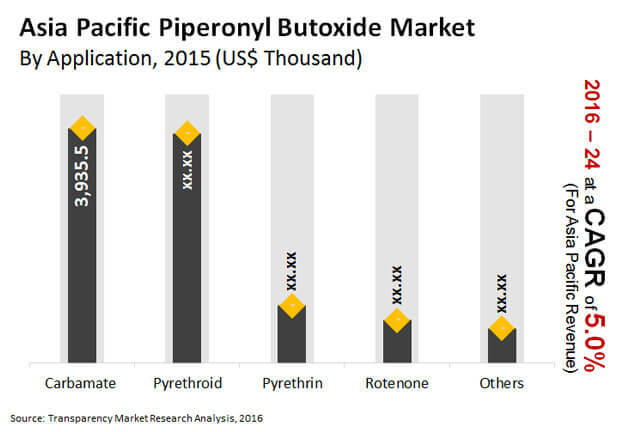 Companies operating in the Asia Pacific piperonyl butoxide market are expected to earn revenue from long-term contracts. These contracts are also expected to protect the companies from volatile prices of raw materials. Expanding operations in India and China is expected to be one the key business strategies of these companies in the forthcoming years. In tandem with this trend, ENDURA P.IVA has been proactively looking for opportunities in these developing countries to increase PBO production capacities. According to the research report, the Asia Pacific piperonyl butoxide market is expected to be worth US$15.45 mn by the end of 2024 from US$10.02 mn in 2015. During the forecast years of 2015 and 2024, the overall market is projected to register a steady CAGR of 5.0%. In terms of countries in the Asia Pacific piperonyl butoxide market, China is expected to lead the piperonyl butoxide market during the forecast period with a demand share of 45.0%. Application-wise, carbamate is projected to dominate the Asia Pacific piperonyl butoxide market. As of 2015, this application segment held a share of 39.3% in the overall market. Analysts predict that the growth of the Asia Pacific piperonyl butoxide market will be steady in the coming years as the region is undergoing major agricultural reforms. PBO is extensively used for the production of pesticides and insecticides and thus finds usage in developing countries where agriculture is an integral part of the economy. Growing risk of pest infestation has led to a rise in the uptake of PBO in recent years. The report states that Asia Pacific loses about a quarter of its yield to insects and pests. Thus, the urgent need to mitigate such disasters and to avoid wastage of crop yield are likely to increase the demand for PBO in the coming years. Countries such as India and China are expected to lead this growth as the climatic conditions and traditional agricultural methods leave major scope for infestation. Food grains and crops are harvested stored in huge warehouses, which are more often than not susceptible to pest infestation. Spoilage of food due to poor maintenance of warehouses is a commonly seen case in developing countries. To avoid these scenarios, farmers and vendors are expected to use PBO in the near future. The growing demand for food against the backdrop of exponential rise in population is expected to benefit Asia Pacific piperonyl butoxide market. The overall market is expected to witness a high demand for carbamate as it is used for household applications as well. On the other hand, the Asia Pacific piperonyl butoxide market is expected to face some tough challenges in the coming years. Conventionally used pesticides such as organophosphate, benzoylurea, organosulfur, and organochlorine are extremely affordable and will thus continue to overpower PBO in the near future. The complicated production process of PBO is also anticipated to hamper the growth of its market in Asia Pacific during the forecast period. This review is based on Transparency Market Research’s report, titled “Piperonyl Butoxide (PBO) Market – (Application - Pyrethrin, Pyrethroid, Carbamate, Rotenone) - Asia Pacific Industry Analysis, Size, Share, Growth, Trends, and Forecast 2016 – 2024”.